This recipe is based on Rabo de Toro, which is very popular during the winter months in the colder parts of Spain. It's very easy to make, although the vegetables take quite a bit of prepping and the meat needs a seriously long braise. Heat a generous glug of vegetable oil in a large frying pan on medium heat. Peel and chop the onion quite small. Place the meat in the pan, turning frequently with tongs to get it browned all over. While this is going on, add the onions and stir until softened but not too brown. Top, tail and peel the parsnips (if using - it is optional) and carrots. Peel the potatoes. Cut the parsnips, carrots and spuds into bite-sized chunks and put them in your crockpot or casserole. Chop the celery and parsley finely, and add them to the pot. If you don't have fresh parsley, you can use 2 teaspoons of dried. Pour the stock over, stir well, then add the meat, onions and pan juices and stir again. Add a few grinds of black pepper. If the stock doesn't cover the meat, add more stock or boiling water. If you are using a slow cooker / crockpot, switch it on high, put a lid on and leave it alone for 8 hours. Or you can do it as a casserole in a medium/low oven - put a lid on the casserole dish and and let it cook for 4 hours. Ladle meat, veg and liquid into shallow bowls and serve with crusty bread and a dollop of pickled red cabbage. The video above is from the Keef Cooks YouTube channel. 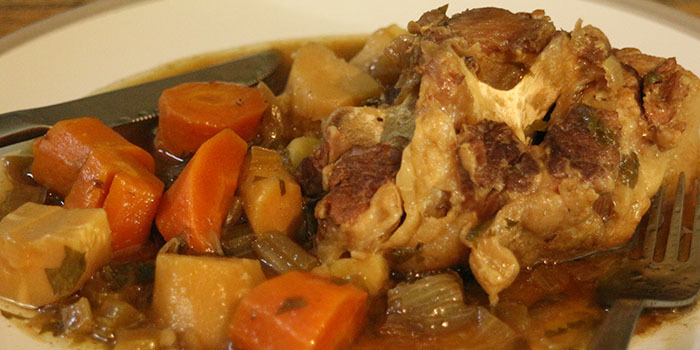 Click here to see the video recipe of Oxtail Stew / Rabo de Toro on YouTube. Oil for sautéeing, ground black pepper to taste. Total time: 8 hours 20 minutes.